Experience Mario Bava’s horror classic Black Sabbath (original Italian title: “Three Faces of Fear“)–as it’s never been seen in America before! A beautiful woman is terrorized by calls from an ex-lover who has escaped prison for the pleasure of killing her… A family becomes a feeding ground when their father returns home wounded after ridding the countryside of a hideous vampire… A nurse is haunted by reproaches from the Beyond after stealing a ring from the finger of a dead medium! Join Boris Karloff as he hosts (and stars in) this trilogy of terror tales–presented in its original aspect ratio and in Italian with English subtitles, with every shock intact! 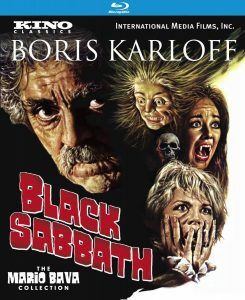 In short, Black Sabbath is an anthology horror film, with three unrelated stories, introduced by Boris Karloff. Karloff stars in the final film as well. I watched the Americanized version, which is different from the original Italian version, and that’s what’s reviewed here. The Telephone: a woman receives a series of phone calls from her former boyfriend. Her testimony sent him to be executed. But the calls continue. She turns to her dead boyfriend’s former girlfriend for help. But the former girlfriend’s behind the prank. Isn’t she? The Drop of Water: a nurse is called to deal with the body of a dead medium. She steals a beautiful ring from the corpse, spilling a glass of water in the process. She keeps hearing dripping, amid other strange things. Eventually, she’s confronted by the corpse – that looks like a mannequin, ruining this segment. The Wurdulak: frankly the best, and most creepy, of the stories. A father (Boris Karloff) kills a Wurdulak, a vampire-like creature that feasts on its’ own family. And the father is infected and proceeds to “harvest” his loved ones, one at a time. Truly unnerving, as he murders his own grandchild, and uses him as bait for his own daughter. “Mommy, I’m so cold …” Truly unnerving, frightening, and compelling.